Durham County Council flew the flag in support of World Aids Day. World Aids Day (WAD), held last Saturday, invited people from around the world to show support for people living with HIV and remember those who have died from Aids-related illnesses. 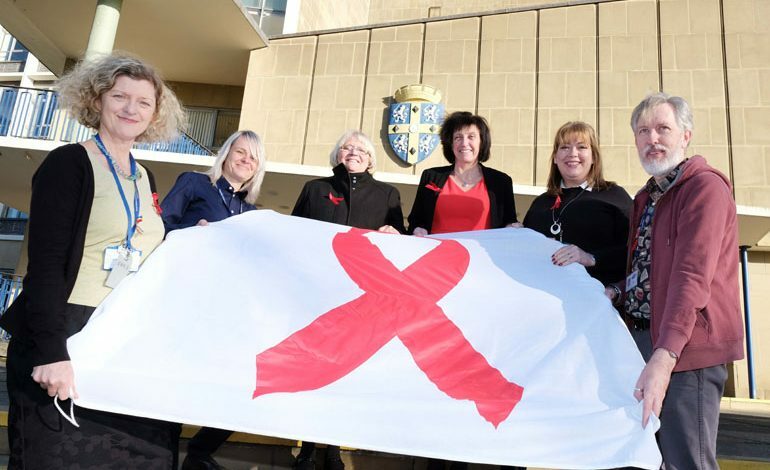 Durham County Council joined in the campaign, flying a World Aids Day flag above County Hall. County Durham’s integrated Sexual Health Service, delivered by County Durham and Darlington Foundation Trust, presented information about WAD and broader sexual health services at County Hall during the flag raising on Friday. Visitors to Durham city centre were also be able to see the Town Hall lit up red on Saturday, a colour chosen to represent the red ribbon which is the universal symbol of awareness and support for people living with HIV. Cllr Lucy Hovvels, Cabinet member for adult and health services, said: “We are proud to support World Aids Day, a day that unites people in overcoming fear or stigma and shows solidarity in dealing with the virus. • Pictured above (left to right): Amanda Hale, Sexual Health Improvement and Protection Manager, County Durham and Darlington NHS Foundation Trust, Helen Riddell, Public Health Advanced Practitioner Durham County Council, Cllr Lucy Hovvels, Portfolio Holder for Adult and Health Services, Amanda Healy, Director of Public Health, Michelle Baldwin, Public Health Strategic Manager Durham County Council, Sean Barry, Public Health Practitioner Durham County Council.